Bread Loaves, Breads and Desserts, Breakfast, Cupcakes & Muffins, Cuppylicious! Total time: 30-60 minutes, plus 7-10 days. Friendship bread is that chain-letter-bread that you divide with your neighbors and continue to reap the benefits from over and over again. The concept is to take your starter, triple it, then share it with 2 people. You bake with your share, and they bake with their share in 10 days. In a large mixing bowl, dissolve yeast in warm water, 3-5 minutes. Add remaining ingredients and mix well. Scoop out 1 cup for each of your neighbors. Keep the remaining for yourself. Some people store them in ziplock bags, others in small plastic containers. Either way you do it, this needs to be 3 separate starters. Store in the refrigerator 7-10 days. For the next 7-10 days, either squeeze and massage your starter in its bag or stir it gently with a spoon, daily. In a large mixing bowl, combine your starter, flour, milk, and sugar. Mix well. Scoop out two cups for two more starters for yourself. Continue to Hungry Hippo Style. 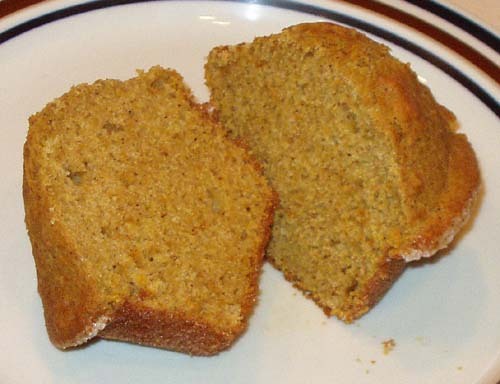 Grease a loaf pan or muffin tin with soft or melted butter. Dust with sugar. In a large mixing bowl, combine your starter and all the other ingredients. Beat until well blended. 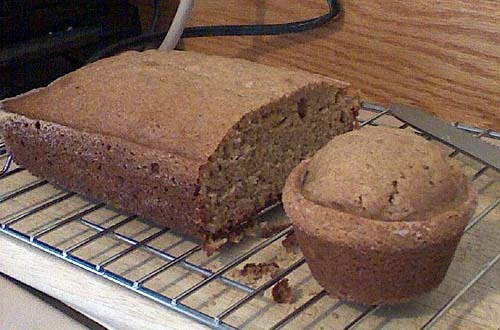 If you want to fold in fruit or other bread or muffin add-ins, now is the time to fold them in. 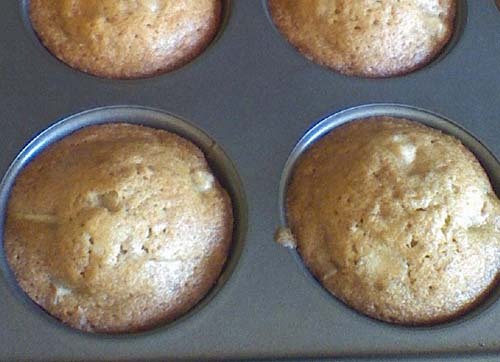 Pour batter into loaf pans or muffin cups. Bake 22-25 minutes until dark golden brown. Do Frugal Fanny Style except only scoop out one cup of new starter for yourself. 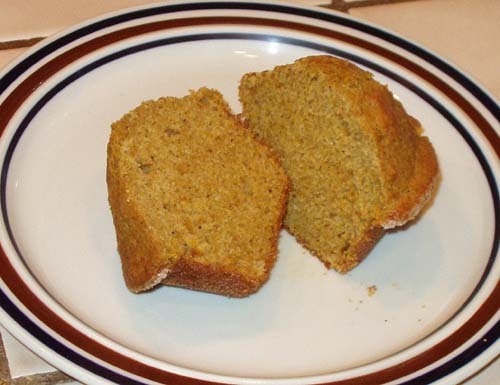 Double the ingredients in Hungry Hippo Style and make two loaves of bread or a loaf of bread and 12 muffins (pictured). If you bake them side by side, increase bake time to 45-60 minutes. Is Stacie Amish? Does Stacie have Amish friends? Is it just the bread that’s Amish? How about none of it. Or let’s say yes to all of it, just for fun. It’s all Amish. Bring on the farm. “Cuppy,” you ask, “what happened to the nice even numbers of 1 scoop this, 1 scoop that? !” I strangely found the original recipe too sweet. Yes, I thought something was too sweet. I blame La Niña. Do you need to share this starter? No. Do you need to share the bread or muffins? No. As of this post, I’ve used the same batter 4 times, and I have one in the refrigerator. In a large nonstick frying pan, melt one stick of butter on medium-high heat. Add ginger root and cook 3-5 minutes until slightly softened. Stir in cinnamon and apples until well coated. Turn off heat and set aside. In a medium bowl, whisk together flour, salt and baking soda. Set aside. In a large mixing bowl, beat together egg and all wet ingredients. Stir in sugar until well adapted (about 10 strokes). Add dry mix and stir until just damp (about 40 strokes). Fold in apples and ginger. Bake 25-30 minutes or until a toothpick comes out mostly clean. Bread Loaves, Breads and Desserts, Cupcakes & Muffins, Cuppylicious! Total time: Approximately 35 minutes. 1 cup milk, 1/2 stick melted butter, 2 eggs lightly beaten. Pour in milk, melted butter and lightly beaten eggs. Mix quickly but not till totally smooth, should be little lumps. 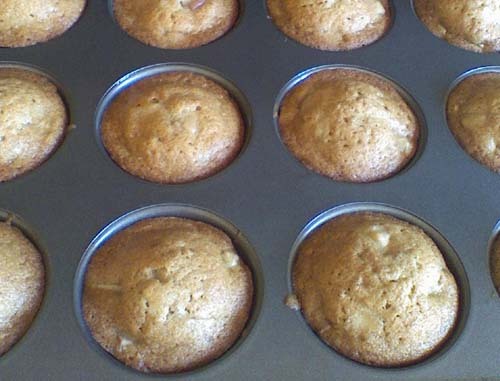 Pour in any pan or muffin tin that leaves a little room for them to expand. Bake for 20-25 min or until slightly brown and crispy on top. Cornbread with black bean soup shown here.